Preheat oven to 400F. Bake puff pastry for about 15 minutes until golden brown. Set aside. In a large skillet, combine peaches, brown sugar, lemon juice and water. Cook at medium-high heat until the peaches start to soften. Reduce heat to low and cook for an additional 10 minutes. Set aside to cool. Fold cooled peaches into cream cheese mixture and refrigerate until ready to assemble. 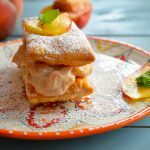 Right before serving, layer peach cream in between 2 pieces of puff pastry. sprinkle with confectioner’s sugar.